Some of you have become aware that Feedburner, our email newsletter service, is beginning to give signals that they may be shutting down. This has been nerve wracking news for many bloggers who have used this free service for so long, since Feedburner and Google--who owns them--have not been unwilling or unable to confirm these suspicions. The signals, however, all point to this anticipated result. All that said, I'm taking action to prepare. I'd like to ask you to subscribe to our new newsletter service so that when the time comes, I'll be able to make sure you continue to receive our updates and know what's going on here. If you're already on the All Things Dog Blog newsletter via Feedburner, you're good to go. I've migrated that list as of last week to assure I can continue to get our news to you. with our Event Barkers' fun and, of course, Oliver's silliness over at 5 Minutes for Fido. Every now and then you'll find that he's got important news offered up in a fun way for your enjoyment. Stay tuned! If you have friends that may be interested in receiving our new newsletter, you can easily email this post to them by clicking on the cute little envelope icon at the bottom. Fill in their email address and off our post will go to them, giving them an opportunity to subscribe if they wish. One last note on your subscription. If you would like to receive a mobile version at your cell phone and a regular format in your email, you may wish to subscribe twice using 2 email addresses. 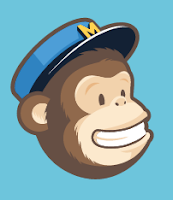 To be honest, I'm not 100% certain you can subscribe two times with the same email address, but if you try it, please do let me know if the MailChimp system allows it. I'd love to share this with my readers. I'll bring you more information on how this will all play out as I get closer. For now, adding yourself to this list will mean nothing more than filling out the form below and activating the service in your email from MailChimp. Tell us Your Dog's birthday & get a surprise! High five to all of you who opted into our new newsletter. I'll keep you posted to let you know when it will commence. Thanks again for reading and do keep in touch with any questions via our comments section or my AllThingsDogBlog@gmail.com email account.